Monday was the final day for regular registration before the June 5 primary. 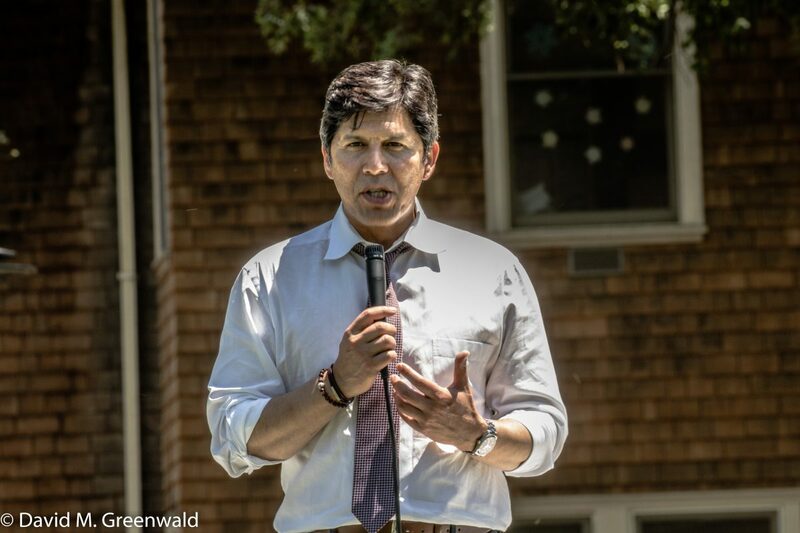 Four candidates highlighted a voter registration rally – Delaine Eastin, who is running for Governor, Kevin de León the former California Senate leader challenging Dianne Feinstein, Dean Johansson running for Yolo County DA and Eric Gudz running for Davis City Council. Delaine Eastin, who lives in Davis and was a UC Davis graduate, is running for Governor. Two decades ago she served as Superintendent of Public Instruction and before that a State Assemblymember. She told the students, “When I entered UC Davis, the tuition was $82.50 a semester. “At that time, the state of California was spending 18 percent of its budget on higher education, and just three percent on prisons,” she said. “Now we’re spending less than 12 percent on higher ed and more than nine percent on prisons. She added, “We should not only be investing in K-12 but universal preschool and child development. “I am the only candidate who has made education, absolutely, her focal point,” Delaine Eastin said. She spoke about student housing, “I support an audit of student housing on this campus – why not? They have nothing to hide, then we ought to do it. He said, “There is something wrong with a system that would charge five people of color, just a short distance away from here on Picnic Day, for basically being on the receiving end of police brutality. Mr. Johansson said that there is something wrong with a system that took one of your fellow classmates who should be standing here today – Eric Pape. Mr. Pape ended up at Sutter Davis hospital over the concern he would commit suicide, and ended up with the strike felony. “You have a system that, instead of coming to him with an open hand and helping him, hit him with a hammer, and kept smacking him and smacking him in court appearance after court appearance, until the very thing feared is what it caused,” he said. Dean Johansson told the crowd that this is mental health month – “64 percent of the people sitting in the jail are suffering from mental illness.” He continued, “We have a system that is preying upon people. Not just the poor, with people of color receiving the brunt. “Here in Yolo County, if you are black you are ten times more likely to be in prison, to be in jail, than a person that’s white. If you’re brown, you’re twice as likely. Something has to change,” he said. 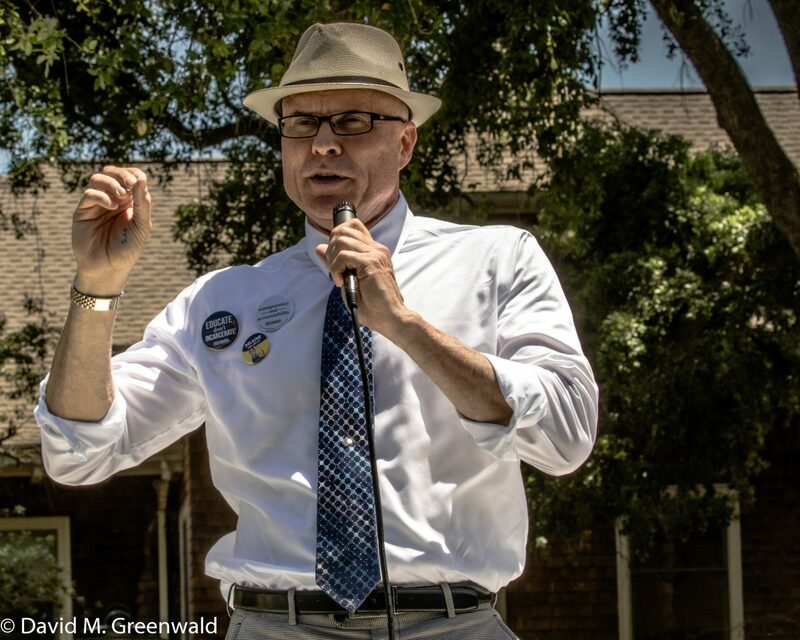 Eric Gudz, running for the Davis City Council, hearkened back to the 1972 Progressive revolution in Davis, telling the crowd, “It was at this very spot in 1972 where the first student to get on our city council, Bob Black, rallied this campus around the new voting age of 18. The Power of Your Vote. Helping to enfranchise thousands, he remains a deep inspiration to me and our campaign for city council to this day. The Power of Your Vote. “Their votes transformed Davis, built bike lanes, the farmer’s market, and told the rest of the town that students matter. The Power of Your Vote,” he said. How many students attended the rally? LOL, my bet is not many because you know if it was well attended David would’ve made a point of it in the article with pictures of the spilling masses. There were only 50 to 100 people there. The reason there was no picture is that they put the stage in the middle of the quad in the sun. It wasn’t that hot yesterday, it was uncomfortable in the direct noon sunlight and so everyone there except maybe 20 people in the middle, were on the edges under shade. Doesn’t make for a good picture. Yeah, small crowds never make for a good picture when the photographer supports one or more of the speaking candidates. I can get a good shot of a 50 to 100 person crowd if they are one location. Huge area and spread out – not so much. How many of those in the shade were simply sitting there between class or maybe having lunch? None. They were holding signs and clapping. “Eastin said that preschool should be mandatory” So she seems to have signed up for the Sacramento Fascist Society. Thanks for that Jim. It really is amazing how biased some reporting can be. I talk to a lot of UCD students every week and I would bet $100 that not a single one has any idea who Eastin, DeLeon, Johansson and Gudz are. Other than a few older grad students none of the kids at UCD were even alive when Eastin served in the State Assembly. P.S. Did anyone ever hear why Eastin decided to run in a long shot campaign for Governor at 70 (maybe hoping Newsom and Villaraigosa will die and she can make the top two with Chiang)? She felt like no one was raising issues of education I guess. Still an excellent speaker. The degree of relative ignorance of undergrad students is well known. Raising awareness is precisely the reason for such a rally, not a reason for deriding it. 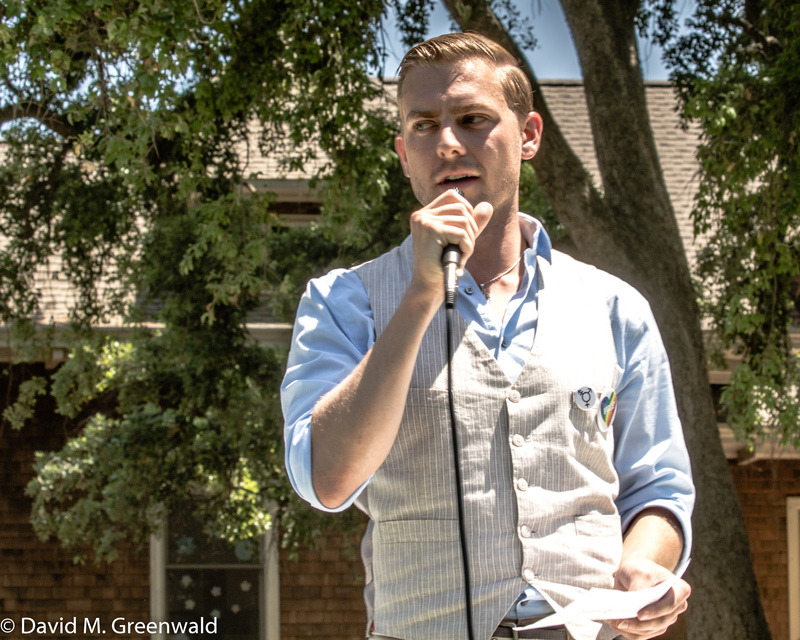 Did you just call UCD graduate students ignorant? 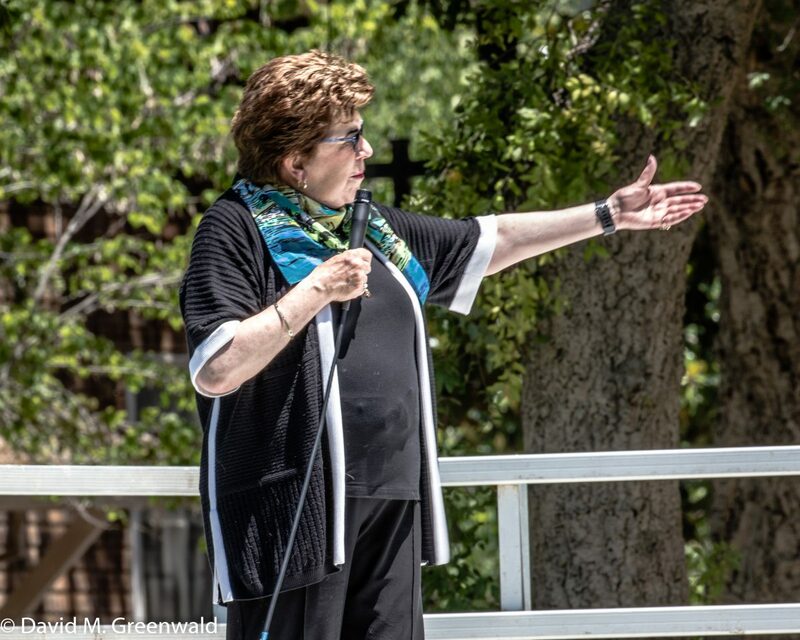 I recently spoke with Delaine Eastin in person. She is very articulate both one on one and presenting to a group. I truly wish that more candidates were as passionate about education as she is. Education is what drives the advances of our society as well as allowing individuals to escape the cycle of “generational poverty”. The fact that we have chosen to gradually emphasize incarceration over eduction is a major problem. Although I share Ken’s belief that this is a long shot campaign, I see that as a pity since her core values are where we should be focusing money and energy. Whether the message has resonance with the target population is more important than the newest iteration of stump speeches. Particularly important for Eric. If he can get students to show up to vote for him than he is a player. Possibly. But there are too many variables to determine whether or not a lack of turn reflects the candidates or the planning process. But one could easily see the headline of this article if Jeff Reisig was the candidate speaking and had the sorry turnout that this event had. You responded so you must. I don’t care about the point you’re making. It doesn’t matter if you think this site is biased, that doesn’t validate your view point. It’s not just my opinion, this site is biased when it comes to many topics. Of course is your opinion – it may be shared by others, it may have validity to it, but it’s just an opinion. But also not the point, you are quite good at distracting from the main point. Well done. “biased” to most people means: “not in agreement with my view of reality”. Though they won’t say it that way because each person’s view of reality is real to them. My reality is that neither Eastin nor Tony Mendoza’s wingman have any chance of winning. Both Dean and Eric do, if they can generate a record setting student turnout. Based on this rally that goal seems increasingly distant. I would describe you reality as a large crater where Rancho Yolo once stood. A crater would not help me. How about real housing? A disgusting comment from a disgusting candidate. If he wins, Davis will get what it deserves. I hesitate to ask – but I fail to see anything disgusting about the comment. And, put down your pencils . . .
Sure, but only for those of you who cannot differentiate between the words “undergrad” and “graduate”. Becoming more amusing, by the moment. The original exchanges that drew me in to the Vanguard were between you and Jeff. Point/counter-point. I actually wish there was more good-natured humor shared, on the Vanguard. However, it’s difficult to do, without insulting someone (intended, or not).